Discover the Galapagos. 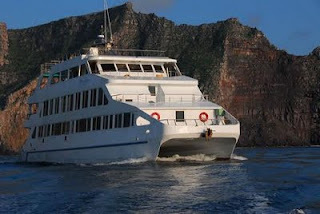 The 97' Motor Yacht Queen of the Galapagos has Lowered its Rates! Experience the journey of a lifetime on board the Queen of Galapagos. The 97ft Motor Yacht is the perfect choice to see the exotic islands that make up this natural wonder of the world. Come face to face with fur seals and penguins. Snap a few photos of flamingos and the sneaky Friate birds. See Giant tortoises and waved albatrosses in one of their last habitats on earth. Snorkel with sea lions. Watch whales, dolphins and stingrays while sunbathing on deck. And much more! We can make your dreams come true. The Queen of Galapagos built in 2007, comfortably accommodates 16 guests in 8 Luxurious rooms plus a master suite with private bathroom and air conditioning. All cabins with private direct ocean view. TV/DVD in each room. Covered up deck and sun deck,diving and more. So come to the Galapagos and Experience the Journey of a Lifetime. *Everything included except flight tickets from mainland Ecuador to Galapagos Islands.